And now for a Halloween story to keep you up at night. The artwork for this story was drawn by horror enthusiast (and also my mother), Bev Parypinski. Wendy opened her eyes. Something had woken her. She gazed around the dark bedroom, at the moonlight slipping in through the parted curtains, at the green glow of the clock. 3:48. Paul lay still beside her, a breathing shape beneath the white sheets. Resigning herself to the interruption and preparing to settle back into sleep, Wendy rolled over on her side, facing away from Paul. But she didn’t close her eyes. Instead she trained them, wide and unblinking, on the figure standing in the corner of the room. Wendy froze. In the darkness, the figure was a mere silhouette, but it stood tall and solid, facing her direction. Watching her. How had he gotten into the house? Had Paul forgotten to lock the door again when he came to bed? Could he see her staring eyes now in the moonlight, knowing that she was awake? Why did he stand there, so still? Paul stirred but didn’t wake. She feared to close her eyes. Her vision grew watery, but the figure remained. “Hmm?” came the half-asleep reply. Paul startled then, reaching his long arm to the light and switching it on. One moment, the figure was there, cloaked in darkness. The next, the light fell over the empty corner. No hanging clothes—nothing that might have created the shape of a man. Nothing. “I saw him. He was just there,” she murmured, sitting up and running a hand through her bedraggled hair. She stood up and pulled on her terrycloth robe against the chill of night. Heart pounding. “Babe. Come back to bed,” said Paul, sliding down to his pillow. Wendy paced left, then right, eyes never leaving the empty corner of the bedroom. Finally she shook her head and stalked down the hall to the kitchen. She dumped some coffee grounds into a filter and listened to the burbling sounds of the brewer working its magic. Outside the windows, the moonlit haze of predawn settled blue over the sweeping front yard with its mess of Halloween decorations. Gravestones erupted from the browning grass, thick white spiderwebs stretched over the bushes, and pumpkins sat on the porch, waiting to be carved into leering faces. Wendy sipped her coffee. The sun crept its way over the horizon, reaching its tendrils across the October night as it slogged steadily toward dawn. With only a few weeks until Halloween, Wendy found it difficult to concentrate. Chatter about parties and haunted houses and cable movie marathons echoed down the halls of the college. She assigned “The Legend of Sleepy Hollow” to her literature class under the guise of discussing how Washington Irving created an American literary tradition and played with unreliable narration—but really, she assigned it because it had been Clayton’s favorite story. Her brother had always loved Halloween, and it was perhaps because of this that Wendy found herself drawn back into the holiday every year. A remembrance for Clayton. Had she and Paul not inherited her childhood house when her father had moved into the nursing home, the memories might not have been so strong. Yet in all the old decorations she remembered putting up as a kid, in all the groans of the house’s floorboards and the woods trailing off out back where they used to play hide-and-seek, she sensed the ghostly imprint of his memory. The last students straggled out of the classroom, laughing about headless horsemen. Wendy, staring out the window at the drifts of fallen leaves, hardly noticed. “You seem distracted,” said Paul as he came up beside her. She sat on the front porch, stuffing the annual straw man who would hold vigil until Halloween. When Wendy was a kid, she, Clayton, and their father had found an old gray suit at Goodwill with the name Adlai etched onto the inside collar. After filling the suit with straw, attaching gloves and shoes, and topping it with a stuffed and upturned burlap sack for the head, they named Adlai their greatest success in yard décor. They cut eyeholes in the sack to give the appearance that the straw man was always watching. Then, come Halloween, Wendy’s father would quietly empty Adlai’s suit and don it himself, pulling the burlap sack over his head and sitting still, so still, on the porch—propping himself against the wall as if he, himself, were made of straw. Trick-or-treaters would race up to the house, thinking him a dummy, and Wendy’s father would rise to his feet, sending the children shrieking away in terror. He became something else entirely when he wore the Adlai suit. Something greater and more terrible than the mere man that was her father. He became the very essence of fear. Every year, Adlai came, dusty, out of the basement, and every year Clayton tried him on and found he could not fill the straw man’s suit. Instead he pulled a white sheet over his head and hoped his “boo!”s would scare his friends as much as their father’s transformation into Adlai did. He went off trick-or-treating, leaving little Wendy at home. She preferred handing out the candy, and Clayton always gave her half of his bounty, anyway. Until that year, of course. When Clayton didn’t come back. “Huh?” she murmured, looking up from her memories into Paul’s concerned face. “It’s tradition,” she said, going back to stuffing the sleeves with straw. In a way, Adlai was part of the family. The only part of the family she had left, unless she wanted to drive up the long and winding way to the nursing home where her father lay wheezing on his oxygen, only half-cognizant of the world around him. “That’s the point, isn’t it?” Wendy replied as she picked up the flat sack with its two cut eyeholes, running her fingers over the rough cloth. She remembered how her father had changed when he put it on. Even those who knew of his annual trick could not contain their horror when he leapt, an inanimate dummy turned animate, from the porch. There was nothing so fearsome on Halloween night. He went inside, leaving her alone on the porch. The road was empty, but she saw her neighbors taking out the trash, lighting candles in the windows—performing their own preparations for the witching season. Though she had a stack of ungraded student papers sitting on her desk inside, Wendy worked slowly, deliberately. The essays could wait. Adlai lay patiently on her lap, waiting to be filled. She had a hard time falling asleep that night. She kept snapping her eyes to the corner of the room, expecting to see a figure hovering in the shadows. There was nothing there. Paul’s snores began filling the room as sleep claimed him. Wendy remained awake, thinking about Halloween. People always seemed surprised at her devotion to Halloween—especially those who knew about Clayton. They wondered how someone with such a tragic history connected to the holiday could put up decorations every year, hand out candy to trick-or-treaters, and even fashion her classroom activities in accordance with autumn festivities. 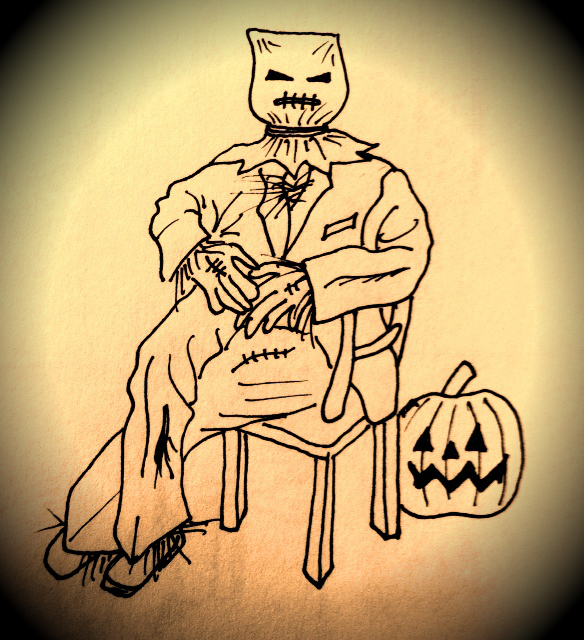 That year—Clayton’s fourteenth—he’d run with a crowd of high school kids, some a little older than he, some who carried paper bags filled with whiskey bottles and went house-to-house smashing jack-o-lanterns into a pulpy mess on the street. If he couldn’t be Adlai, he had decided he would be something else. A corporeal ghost, perhaps, who went about causing mischief. A poltergeist. He’d said he was going trick-or-treating, but instead he’d gone with his friends to the cemetery to drink booze and unroll toilet paper and play loud music on a boom box. Wendy never got the whole story. All she knew was that some commotion had stirred—from the booze or from the knife someone had brought or from a stranger who had stumbled into their midst—and Clayton was stabbed. Wendy pictured the body lying crumpled beneath the sheet, blood spreading on the white cloth. She rolled over, sleep drifting farther and farther from her grasp. She’d asked Paul if he would put on the Adlai suit this year. He didn’t seem eager to take on the role. Last year, Adlai had remained a straw man throughout Halloween, and Wendy didn’t like it. The eyes in the burlap sack stared almost accusatorily into the night. I will not be forgotten, they seemed to say. Clayton had always wanted to put on the suit, and now he never would. I will not be forgotten. At some point, Wendy must have drifted off, because when she woke again, it was in the darkness of the three o’clock hour. She blinked, trying to orient herself in the still of night. The moon glistened through the curtains like a spiderweb strand blowing on the wind. Still sleep-clouded, Wendy turned her eyes to the corner of the bedroom. The figure stood in the shadows. Her heart paused mid-beat, then rapidly restarted. Her eyes adjusted to the darkness, and the figure resolved itself. Solid, real, it stood in the corner, face turned toward the bed. That face appeared misshapen, as though the skin were hewn from some thick, rough material. Moonlight washed in through the window, and she saw it: the gray suit, the burlap sack with two dark eyeholes cut away so that whoever—or whatever—inhabited the suit might see. She tried to call out for Paul, but her vocal cords were frozen. The figure in the suit, standing in the thin beam of moonlight, did not move. It was still—still as a straw man. Still as the person who had once inhabited the suit. “Dad?” her voice cracked on the word, on the dread pooling in her chest. She lay on her side, afraid to move. Even as she called out for him, she knew it could not be her father. He was dying slowly in a nursing home fifty miles north. Then another thought came to her—one that turned her insides cold. She let out a shuddering breath. The straw man watched her through the black eyes of his burlap face. Unable to stand the stalemate the two of them shared in the darkness, Wendy turned over, her back to the figure, and reached out for Paul. Her hand fell on a cold, flat sheet and Paul’s indentation in the mattress. He wasn’t there. All she could hear in the silence was her own labored breathing, her heart pounding in her ears. Then a creak in the hallway—footsteps? Was Paul out there, unable to sleep? And if he was, then who was wearing the suit? “You’re not Paul,” she whispered. Slowly, the burlap head turned left, then right. Wendy threw off the sheet and dashed from the room, down the hall, looking around for Paul. She called his name as she raced through the darkness, fell into pools of moonlight. “Paul!” she shouted as she entered the kitchen, which lay dormant and dark. A cool breeze blew, and Wendy turned around. The front door stood ajar. She crept toward it. “Paul?” She peered outside. All was dark and still but for the rustling, windblown leaves. The porch sat empty of its straw man. The rest of the decorations—spiderwebs, gravestones, pumpkins—remained. Fear shivering through her, Wendy closed the front door and turned back into the dark foyer. “Paul?” she called again. She felt naked, vulnerable. Stepping back into the kitchen, she fumbled around until she found her sharpest butcher knife. She crept back down the hall to the bedroom, feeling her way through the darkness. The silver shine of the knife gleamed before her. Standing against the wall and breathing slowly to calm her nerves, Wendy peered through the open doorway to the bedroom. A shape lay under the white sheet. Sleeping, perhaps. How, she wondered, could Paul sleep at a time like this? As she approached the figure on the bed, she couldn’t help but think of Clayton: a corpse beneath his ghost sheet. She knew it must be Paul sleeping under there, but still she reached tremblingly forward. Before she could pull off the sheet, the floorboards behind her creaked with a footfall, and she spun around and thrust the knife deep into the chest of Adlai’s gray suit. Where she had expected to find a thin packing of straw, instead the knife sank into solid flesh. Blood bloomed around the protruding hilt. Wendy let go of the knife and stumbled away from the creature, who now bent over the wound, clutching with gloved fingers at the knife. She reached up for the burlap sack and pulled it off, revealing the face of Paul, pale and sweaty with pain—Paul who wasn’t Paul but was Adlai, his eyes already glassy as he sank to his knees. Horror rushed through Wendy as she watched him fall, watched him wheeze his last struggling breaths and then go still. Still as a straw man. “Paul?” she whispered, disbelieving her eyes. If Paul was wearing the Adlai suit… Wendy turned around to the figure on the bed and threw off the white sheet. What lay beneath was a pile of straw shaped into the semblance of a man. She looked from Paul’s body on the floor to the straw on the bed. She was still holding the burlap sack in her hand, its black eyeholes staring and staring. Maybe there was only one person who was meant to wear Adlai’s suit. To embody the spirit they’d brought into their home long ago, the one etched into the fraying seams of the gray jacket. Not Clayton, not Paul. Maybe not even her father. Slowly, Wendy pulled the burlap sack over her head. Thanks for another Coffin Hop short story! Amazing story! I love your style and can’t wait what else your dark pen brings to life. Happy hopping!